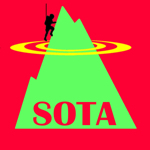 KX6A - Michael's amateur radio and SOTA site. My 2017 goals worked out well, so I’ll be continuing the program again this year by posting my Amateur Radio Goals for 2018. I am starting the year with 608 total activator points. Last year I earned 396 of those. Now that I have another year of experience and familiarity with the local peaks etc., I aim to earn 392 more points this year. This is a real stretch, this year I have some competing time demands with training for a trail race and leading a Philmont Trek with our Boy Scout troop. I don’t have quite the free time I did last year when I racked up 396 point so I’ll be curious to see how this develops. However, that is the goal: Mountain Goat by end of 2018. Once again I am posting my results for the previous year’s goals. I’m pretty satisfied with my results, but my “we’ll see, might as well add it” goal from last year – Goal #5 – became my obsession in the later part of the year. 1. 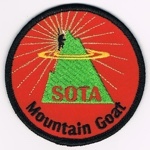 500 SOTA Activator Points – Half Way to Mountain Goat – ACHIEVED! As of the close of 2017, I have 608 activator points. This took some work, but I more than exceeded my goal by accumulating 396 activator points over the year. This was a lot of fun, and resulted in some interesting days, including the Big Bear 6 Pack of SOTA Peaks in one day: W6/CT-051 Arctic Point, W6/CT-060 Pk. 7940, W6/CT-054 Bertha Peak, W6/CT-009 Butler Peak, W6/CT-050 Delamar Mountain and W6/CT-013 Keller Peak. That was a long day and made for a memorable adventure. A first time activation for Peak 11,100. My son Nick described Sheep Mountain as “like a moonscape”.